The Carson and Colorado Railway was incorporated May 10, 1880 to build a narrow gauge rail line from Mound House on the Virginia and Truckee Railroad along the Carson River to a point on the Colorado River, hence Carson & Colorado. Construction started May 31, 1880 and reached Keeler on Owens Lake July 12, 1883. The first train arrived at Keeler August 1, 1883. The railroad was purchased by the Southern Pacific Railroad in March 1900 which continued to operate it as the Carson and Colorado. In October 1904, the Hazen Cut-off was started as standard gauge and the narrow gauge track was changed to standard gauge south to Tonopah Jct., a few miles south of Mina. The new track was finished in August 1905. The name of the railroad was changed to Nevada and California Railway on May 11, 1905. 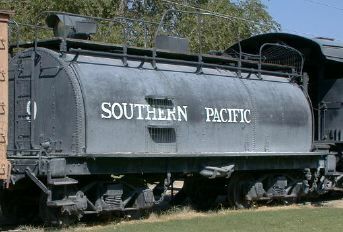 In 1912 the name was again changed to Southern Pacific. The narrow gauge line from Mina to Benton was abandoned in 1938, and from Benton to Laws in 1942. The rest of the line from Laws to Keeler was abandoned April 30, 1959. The Southern Pacific standard gauge line from Mojave to Lone Pine was built between May 1908 and October 1910. 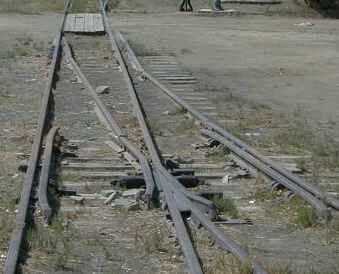 The line from Lone Pine to Searles was abandoned in 1982. The line was called the "Slim Princess" by the local population. Until Hwy. 395 was paved and improved along the west side of the Owens Valley, the Slim Princess was a major transportation resource. However, it was built to service mineral resources and it ran down the less habitable east side of the valley. All the "major" population centers of the Owens Valley are spread out along Hwy. 395 so that it was a long trip just to get to the railroad. The Laws Railroad Museum was established at the site of old Laws depot after abandonment of the railroad. A single 4-6-0 engine and a string of cars still sit there along with many displays of period artifacts. If you are ever in the Owens Valley, stop by Laws, its worth the trip. Another of the narrow gauge engines sits in a park display in Independence, CA right next to Hwy. 395. Locomotive No. 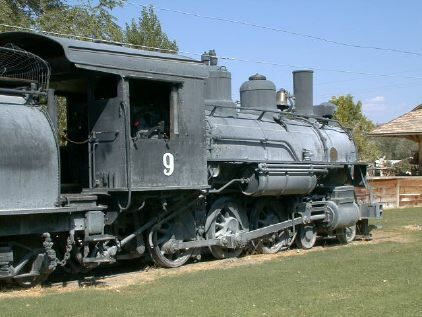 9, a 4-6-0, was built by the Baldwin Locomotive Works, November 1909 for the Nevada-Calif.-Oregon Railway as their No. 9. It was acquired by the Southern Pacific Railroad, September 1, 1929, rebuilt and put in service on the Owens Valley line Feb. 21 1930 as the S P No. 9. It was put on stand-by service when the diesel electric locomotive was put in service, Oct. 1954, was retired when the railroad was abandoned. The locomotive was donated to the City of Bishop and moved to Laws for display, April 30, 1960. The engine is displayed at the head of a short train of wood cars. The cab is open to visitors and the bell works fine. Every kid that climbed in the cab rings the bell. Most SP engines ran on oil as both wood and coal are rather scarce in the eastern Sierra. SP used the lowest grade of oil that they could get and these locos smoked heavily even when fired correctly. Following the engine in the display, there is a well preserved wooden boxcar wearing the original C&C lettering. 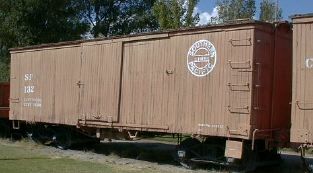 A similar boxcar, this time lettered for SP, follows the C&C car. This side dump gondola was the next in line. These cars were usually used for hauling ballast so that it could be dumped right at the side of the tracks. The dump doors are as simple as they get. Between each door is a piece of angle iron that is pivoted at the center. The piece could be turned to either hold the doors shut or to prop them open. 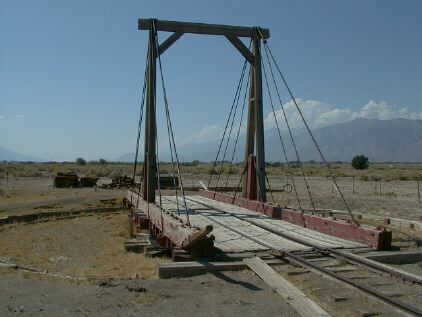 The Slim Princess hauled livestock that was grazed in the fairly dry ranches of the Owens Valley north to the railhead at Mound House where the stock could be transferred to the V&T and eventually to the rest of the SP system. 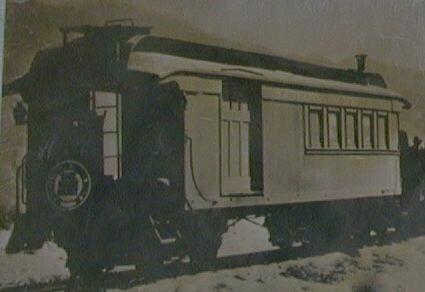 This car was built by the Carter Brothers Manufacturing Company in 1881 for the San Joaquin and Sierra Nevada Railway, a Southern Pacific subsidiary, as a baggage-coach for passenger service. In 1888, it became the property of the Northern Railway, another Southern Pacific subsidiary, as their number 1009, and in 1904 went to Southern Pacific's South Pacific Coast Railway still numbered 1009. 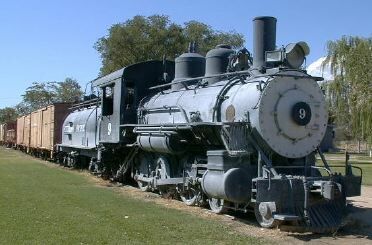 On July 1, 1906, it became the property of the Nevada and California Railway and was numbered 8. In 1912 when the Nevada and California was changed to Southern Pacific, the car was renumbered MW8 and was assigned to work train service. It was renumbered several times during it work train days, MW 8-1, 16-B and 16. 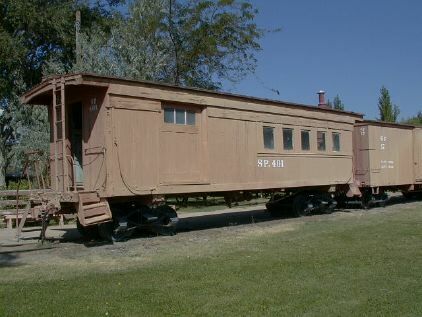 In 1947 the car was rebuilt for caboose and passenger service and renumbered 401. The passenger car trucks were replaced with freight car trucks in 1948, and in late 1952, it was rebuilt again with a flat roof. The car was retired when the railroad was abandoned and was donated and moved to the Laws Museum on April 30, 1960. The car is 34 feet long and weighted 18,500 pounds as a passenger car. This is a very faded old photo of #401 in grander days. A fairly complete list of the loco and rolling stock rosters are available at SPNG Locomotive Roster and SPNG Rolling Stock. These are photos of placards posted in the displays at Laws. To be marginally readable, the photos are taken at high resolution so the pictures are quite large. Laws was a major depot on the SP Narrow Gauge and there are still some service facilities there. This is a typical stub switch however it is not currently functional. 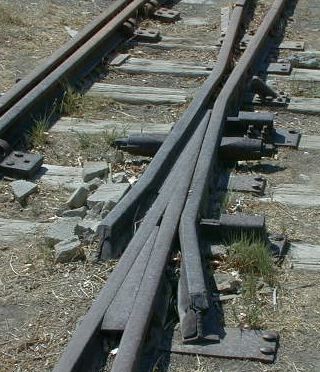 The lead rails (at the top of the picture) are now pinned in a grade crossing and cannot be moved to match the diverging rails. If you look carefully at the stub switch, you will find that it has a sprung frog. I've never seen a sprung frog before and for the life of me, I can't see why they would need one on a stub switch where the "point" end cannot be sprung. Just south of the stub switch is an engine fueling facility. 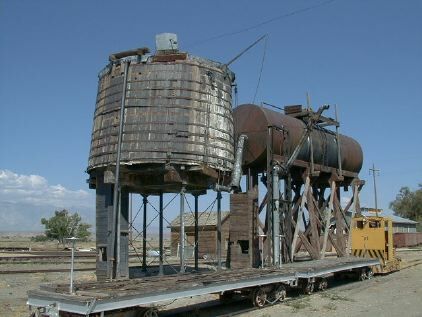 Since all the engines were oil fired, an old tank car is raised on stilts to provide fuel oil. A more conventional water tower is also here, but it looks like that it could no longer hold any water. There is a well preserved armstrong type gallows turntable at the sound end of the property. This prototype can be found on many small railroads. The large handle at the lower left is the turning mechanism. If the engine was centered and balanced properly, two men could turn it. All of the SPNG freight equipment ran on archbar type trucks. This design was popular until around the turn of the century as it could be fabricated from sheet and bar stock, bolts, rivets and sometimes wood beams. Only the relatively small journal boxes and wheels are cast parts. The downside of the design is that it wasn't very strong and a broken bar, bolt or rivet would usually cause the truck to collapse and result in a derailment.